Is there a better alternative to Romulan Hunt (Command Line)? Is Romulan Hunt (Command Line) really the best app in Source category? Will Romulan Hunt (Command Line) work good on macOS 10.13.4? 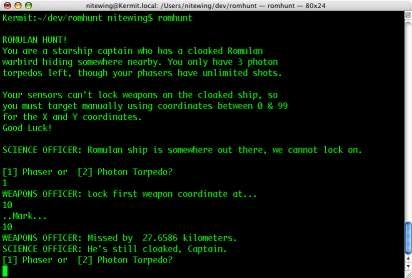 Romulan Hunt (Command Line) is the command-line-only version of Romulan Hunt. Playable in Terminal (or X11). An example of a Foundation Tool in Xcode. Includes executable (PPC only), source code, and man page. Added -v flag. Romhunt now reports version information if you use this flag. Re-compiled as Universal binary. Should run on Intel Macs. Romulan Hunt (Command Line) needs a rating. Be the first to rate this app and get the discussion started!